I'm just a regular mom, figuring out life with my daughter Sophia, who has cystic fibrosis.Take this journey with me. 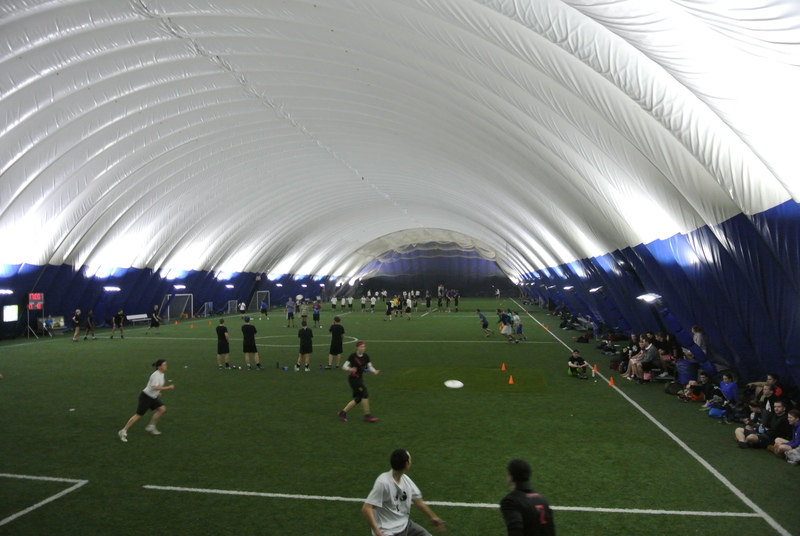 One dome, 8 fields, 8 discs, 16 teams, 160 players, $6000. Zero referees. Organized chaos. Calls of ‘up,’ ‘travel,’ ‘stall,’ ‘not in,’ echo through Redeemer University’s covered dome, while athletes ranging from ‘weekend warrior’ to ‘incredibly fit touring player’ run, cut, jump, dive, and catch small white discs flying through the air. Watching the sport makes you realize that Ultimate is no joke. Playing it makes you realize how physically demanding it is to make your body sprint, stop, change direction, AND catch a disc. It’s not a game for fools (but they’re still welcome to play- most of us are just nice that way). What it is, is a community of athletes. People who get together and play all year round. People who love the sport. People with big hearts. 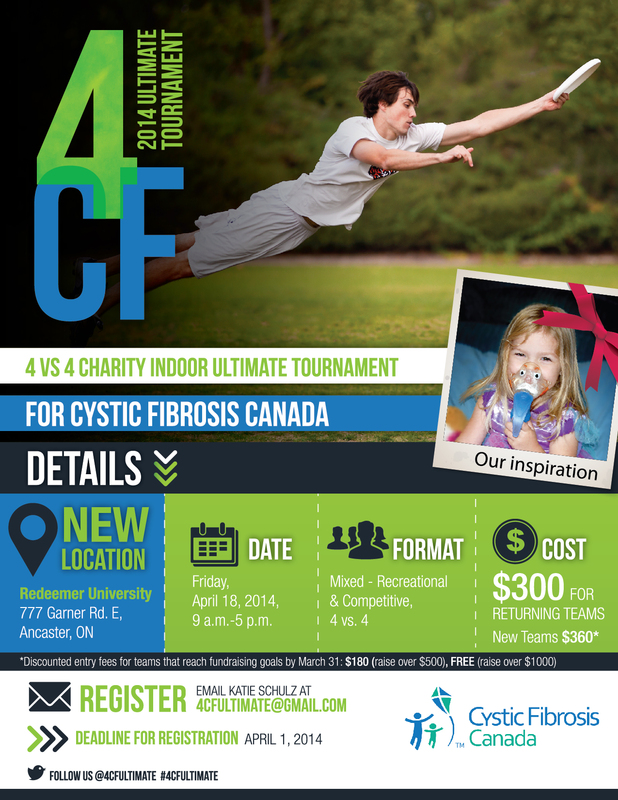 This is our 3rd year running the 4CF Charity Ultimate Tournament. All proceeds go to Cystic Fibrosis Canada. We’ve raised $15,000 over the past 3 years, with $6000 raised already this year. Our first year there were 44 of us, playing through the night. In the second year, there were 140 of us. This year, there were over 160. And that was just Part One. Back by popular demand, we are running a ‘Part Two’ this year, with the hope of matching what we raised in Part One. A special shout-out is in order for all the businesses that donate their time, goods, and services. Thank you Patch Design (http://patchdesign.ca/), Soccerworld (http://www.soccerworldhamilton.com/index), FIVE Ultimate (http://fiveultimate.com/), Breakmark Ultimate (http://www.breakmark.com/), VC Ultimate (http://www.vcultimate.com/), Walmart, Metro, Fortinos, Sobey’s, and FreshCo. For some, it’s a fun day out. For others, it’s a chance to practice with their outdoor team. For me, it’s more than that. It’s for my daughter, and for her future. It fills me with happiness to see hundreds of friends playing Ultimate, knowing that every dollar raised is going towards vital research and clinical care. Thank you. 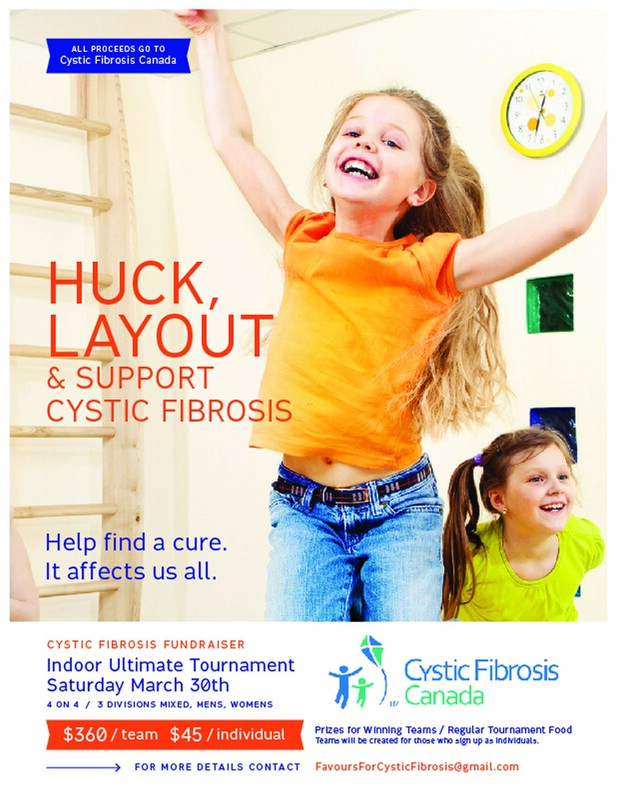 Tags: CF, cystic fibrosis, frisbee, fundraiser, sports, ultimate | Permalink. After a couple of months of planning, we pulled off our 2nd Annual Charity Ultimate Tournament last weekend. My friend TJ is a great ‘ideas’ kind of guy. He approached me in January and suggested we try to make this year’s tournament bigger and better. Last year we had 44 people join our overnight Ultimate tournament (11pm-4am is a tough sell). Even I wasn’t all the keen on staying awake during my prime sleeping hours. This year we decided to try for an all-day tournament. We secured our indoor location, Soccerworld, for March 30th. TJ thought it would be a good idea to try 4 vs 4, and to divide the soccer fields into smaller playing fields. Sounded great to me. Having very little tournament experience, and absolutely no experience with the 4 vs 4 format, I had no idea what I was in for. We started spreading the word, and in no time we had teams and individuals signing up. We ended up with 14 teams from all over Ontario (London, St Catharines, Hamilton, Toronto, Kitchener-Waterloo, Kingston, Oshawa) and even some brave souls from Buffalo. 145 amazing individuals signed up for our tournament! A 3.5-fold increase from last year. We even had VC Ultimate jump on board and offer a great deal on jerseys. This was turning from a few friends gathering to play Ultimate, to a legitimate tournament! Two weeks before the event, I found out that my ‘team of volunteers’ who were supposed to be securing grocery store gift cards to pay for the tournament food weren’t having any success. With 2 sick children, a husband organizing a conference and then away at the conference, we had to do some last-minute scrambling. Incredibly, we were able to secure over $300 in gift cards from Fortinos, Metro, Whole Foods, FreshCo, and Sobeys. More than enough to supply a lovely array of bagels, fruit, granola bars, Gatorade, etc. Thankfully TJ knew what he was in for, and had no trouble working out playing schedules for our Competitive and Recreational divisions. After some last-minute behind-the-scenes stressful moments (timing changes, accommodating individuals and juggling a multitude of scheduling needs), tournament day arrived. It went off without a hitch. Looking at the facility from above, it was a beautiful display of organized chaos (see picture below). Our most spirited team, Inner Ninjas, even arrived with personalized jerseys, swords, bandanas, prizes, and music! I can’t speak for anyone else at the tournament, but I had a great time. I love watching good Ultimate, and I love playing mediocre Ultimate (I bet I’d love being really good at the sport too, but I’m happy where I’m at). From registration alone, we were able to raise $5000 for Cystic Fibrosis Canada. There are more donations coming in daily from Ultimate players who weren’t able to attend the tournament. 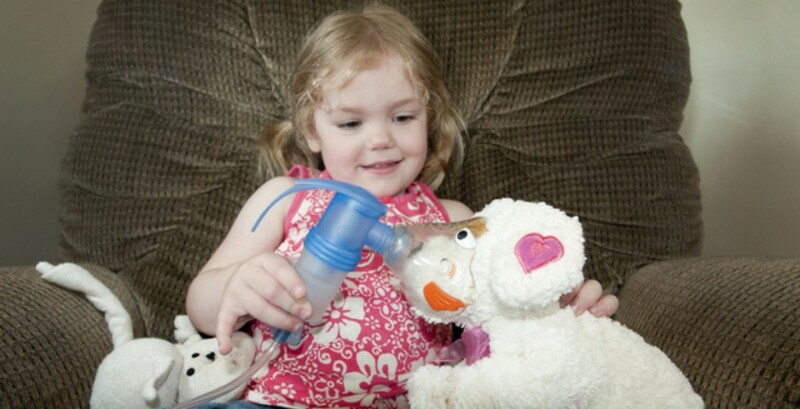 Being able to donate funds to vital research is what gives me hope for my daughter Sophia’s future. What an awesome community to be a part of. Thank you Ultimate players. We’ll see you next year for an even bigger tournament!! Tags: CF, charity, cystic fibrosis, frisbee, fundraising, tournament, ultimate | Permalink. 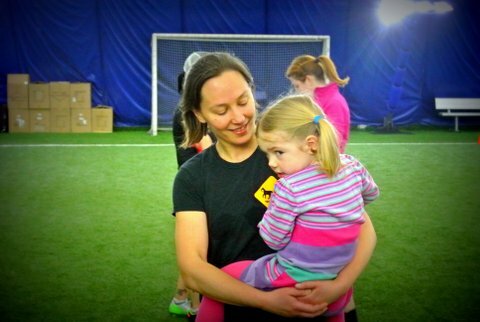 As I gear up for the 2nd Annual Charity Ultimate tournament, with all proceeds going to Cystic Fibrosis Canada, I feel very thankful to be part of such a great community. We started this tournament last year… it was called the 1st Annual Charity Ultimate Tournament then. There were only 4 teams, it took place in the middle of the night (indoors, there were lights, we’re not THAT crazy), but somehow we managed to raise almost $4000. There were so many awesome people who, although they were not all daft enough to want to play Ultimate at night, still supported us by donating to Cystic Fibrosis Canada. This was a true community at work. We live in a world pushed along at lightning speed by smart phones, Twitter, Facebook, and so on. We can be so disconnected from real-life interactions that we spend hours texting others, reading the latest tweets, keeping on top of our email, all while visiting friends- people actually sitting next to us. And this is deemed socially acceptable. Given this frantic state of affairs, I was humbled to see that this type of community still exists. A group of like-minded sporty types all rallying behind a fellow player and her family. Taking a break from their virtual worlds and helping out a friend. This year we are aiming even higher, and running an all-day 4 on 4 ultimate tournament, with Mens, Womens, and Mixed divisions. Instead of 40 people playing, we are aiming for 400! Thank you TJ for lighting the fire. Your enthousiasm is contagious. I am really excited about this event! If you’re in or near Ontario and want to enter a team or as an individual, please email me: FavoursForCysticFibrosis@gmail.com. Tags: CF, community, cystic fibrosis, frisbee, fundraiser, ultimate | Permalink.